Aylmer against Reed & al. A Petition of Robert Reed and Robert Dillon, Respondents to the Appeal of Dame Ellis Aylmer, was presented, and read; praying, "In regard the Petitioner's Papers in this Cause are not yet brought from Ireland; that the Hearing thereof, which stands for Tuesday next, may be adjourned over to such further Day as the House shall think proper." Ordered, That the Hearing the said Cause be put off to Tuesday Sevennight. Hodie 1a vice lecta est Billa, intituled, "An Act for Sale of the Advowson of the Church of Tetbury, in the County of Glocester; and for applying the Money arising by such Sale for re-building the said Church." The Duke of Portland reported from the Lords Committees to whom the Bill, intituled, "An Act for making more effectual Two Acts of Parliament, passed in the Seventh and Tenth Years of Her late Majesty Queen Anne, for preserving and enlarging the Harbour of Whitehaven, in the County of Cumberland; and for repairing and amending the High Roads leading to the said Harbour and Town of Whitehaven," was committed: "That they had considered the said Bill, and examined the Allegations thereof, which they found to be true; and that the Committee had gone through the Bill, and directed him to report the same to the House, without any Amendment." The Duke of Portland made the like Report from the Lords Committees to whom the Bill, intituled, "An Act for further enlarging the Term granted by an Act of the Ninth and Tenth Years of the Reign of King William the Third, for cleansing and making navigable the Channel, from The Hithe at Colchester, to Wivenhoe; and for making the said Act, and another Act of the Fifth Year of the Reign of His late Majesty King George the First, for enlarging the Term granted by the said Act of the Ninth and Tenth Years of the Reign of King William the Third, more effectual," was committed. General Register for England and Wales, Bill. 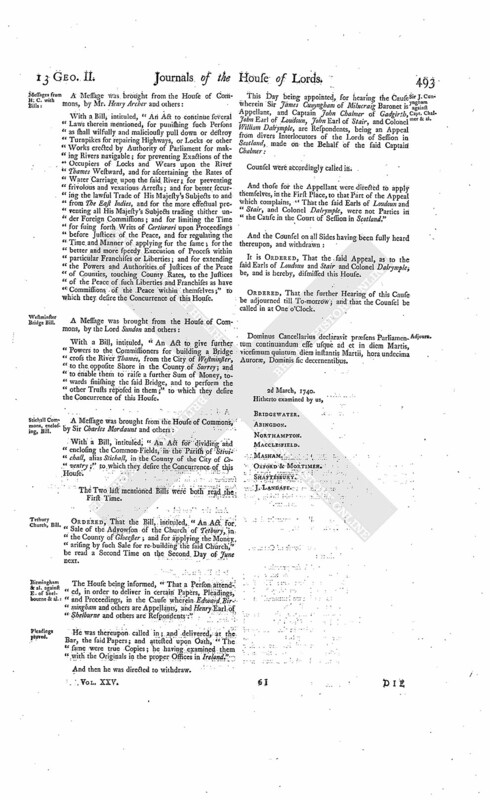 The House (according to Order) was adjourned during Pleasure, and put into a Committee again on the Bill, intituled, "An Act for the public Registering Deeds, Conveyances, and Encumbrances, that shall be made of, or may affect, Honours, Manors, Lands, Tenements, or Hereditaments, within that Part of Great Britain called England, and the Dominion of Wales." And the Earl of Warwick reported, "That the Committee had gone through the Bill, and made several Amendments thereunto; which he was directed to report to the House, when their Lordships will please to receive the same." Ordered, That the said Report be received on this Day Sevennight. Dominus Cancellarius declaravit præsens Parliamentum continuandum esse usque ad & in diem Lunæ, vicesimum quartum diem instantis Martii, hora undecima Auroræ, Dominis sic decernentibus. Hodie 3a vice lecta est Billa, intituled, "An Act for making more effectual Two Acts of Parliament, passed in the Seventh and Tenth Years of Her late Majesty Queen Anne, for preserving and enlarging the Harbour of Whitehaven, in the County of Cumberland; and for repairing and amending the High Roads leading to the said Harbour and Town of Whitehaven." Hodie 3a vice lecta est Billa, intituled, "An Act for further enlarging the Term granted by an Act of the Ninth and Tenth Years of the Reign of King William the Third, for cleansing and making navigable the Channel, from The Hithe at Colchester, to Wivenhoe; and for making the said Act, and another Act of the Fifth Year of the Reign of His late Majesty King George the First, for enlarging the Term granted by the said Act of the Ninth and Tenth Years of the Reign of King William the Third, more effectual." Messages to H. C. that the Lords have agreed to the Two preceding Bills. The Lord Delawarr reported from the Lords Committees to whom the Bill intituled, "An Act for vesting the Inheritance of Part of the Estate of George late Earl of Halifax, deceased, in Trustees, for Payment of his Debts, Daughters Portions, and Legacies," was committed: "That they had considered the said Bill, and examined the Allegations thereof, which they found to be true; that the Parties concerned had given their Consents; and that the Committee had gone through the Bill, and made some Amendments thereunto." Ordered, That the said Bill, with the Amendments, be engrossed. And the like Order was made. The Earl of Shaftesbury also reported from the Lords Committees to whom the Bill, intituled, "An Act for continuing and making more effectual an Act passed in the Fifth Year of the Reign of His late Majesty King George the First, for repairing the Roads from the Top of Stoken Church Hill to Enslow Bridge; and the Road from Wheatly Bridge, through the City of Oxon, by Begbrook, to New Woodstock, in the County of Oxon (except the Mile-way on each Side the said City); and for repairing the Road from The Crown Alehouse to the Turnpike on Stoken Church Hill aforesaid," was committed: "That they had considered the said Bill, and examined the Allegations thereof, which they found to be true; and that the Committee had gone through the Bill, and made some Amendments thereto." Which were read, by the Clerk. And the same, being read a Second Time, were disagreed to by the House. The Earl of Shaftesbury likewise reported from the Lords Committees to whom the Bill, intituled, "An Act for enlarging the Term and Powers granted and given by an Act passed in the Tenth Year of the Reign of His late Majesty King George the First, intituled, "An Act for repairing the Road leading from Dunchurch, in the County of Warwick, to the Bottom of Meriden Hill, in the same County;" and for making the said Act more effectual," was committed: "That they had considered the said Bill, and examined the Allegations thereof, which they found to be true; and that the Committee had gone through the Bill, and directed him to report the same to the House, without any Amendment." 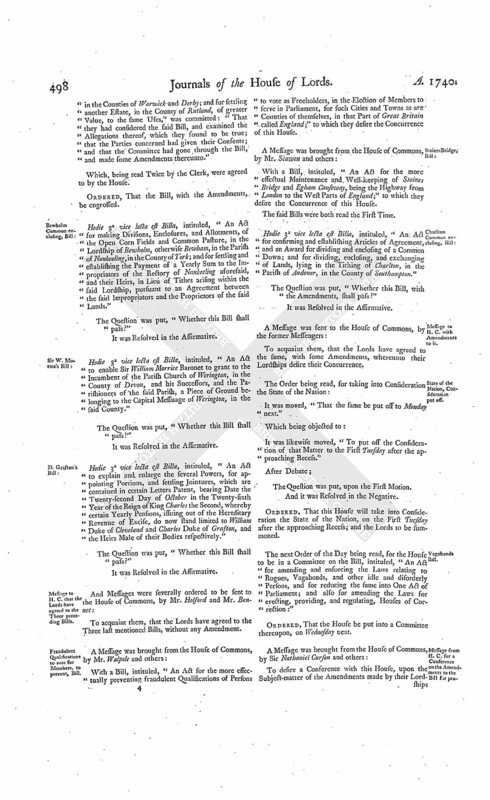 With a Bill, intituled, "An Act to continue several Laws therein mentioned, for punishing such Persons as shall wilfully and maliciously pull down or destroy Turnpikes for repairing Highways, or Locks or other Works erected by Authority of Parliament for making Rivers navigable; for preventing Exactions of the Occupiers of Locks and Wears upon the River Thames Westward, and for ascertaining the Rates of Water Carriage upon the said River; for preventing frivolous and vexatious Arrests; and for better securing the lawful Trade of His Majesty's Subjects to and from The East Indies, and for the more effectual preventing all His Majesty's Subjects trading thither under Foreign Commissions; and for limiting the Time for suing forth Writs of Certiorari upon Proceedings before Justices of the Peace, and for regulating the Time and Manner of applying for the same; for the better and more speedy Execution of Process within particular Franchises or Liberties; and for extending the Powers and Authorities of Justices of the Peace of Counties, touching County Rates, to the Justices of the Peace of such Liberties and Franchises as have Commissions of the Peace within themselves;" to which they desire the Concurrence of this House. With a Bill, intituled, "An Act to give further Powers to the Commissioners for building a Bridge cross the River Thames, from the City of Westminster, to the opposite Shore in the County of Surrey; and to enable them to raise a further Sum of Money, towards finishing the said Bridge, and to perform the other Trusts reposed in them;" to which they desire the Concurrence of this House. With a Bill, intituled, "An Act for dividing and enclosing the Common Fields, in the Parish of Stivichall, alias Stichall, in the County of the City of Coventry;" to which they desire the Concurrence of this House. The Two last mentioned Bills were both read the First Time. Ordered, That the Bill, intituled, "An Act for Sale of the Advowson of the Church of Tetbury, in the County of Glocester; and for applying the Money arising by such Sale for re-building the said Church," be read a Second Time on the Second Day of June next. 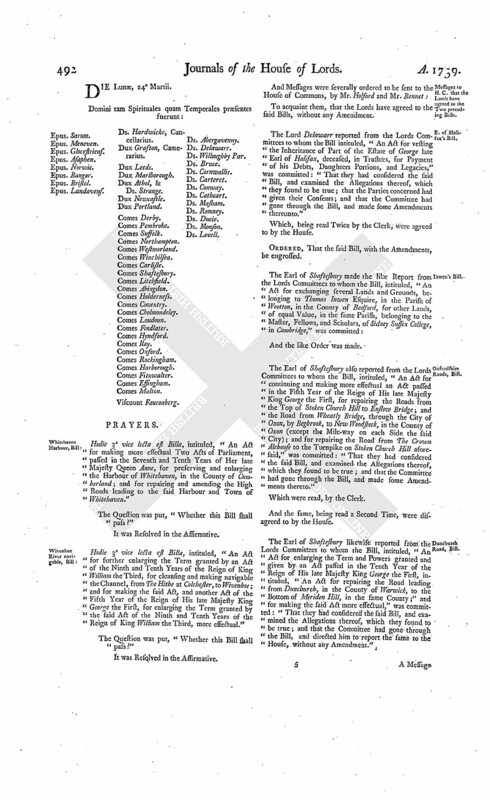 The House being informed, "That a Person attended, in order to deliver in certain Papers, Pleadings, and Proceedings, in the Cause wherein Edward Birmingham and others are Appellants, and Henry Earl of Shelburne and others are Respondents:"
He was thereupon called in; and delivered, at the Bar, the said Papers; and attested upon Oath, "The same were true Copies; he having examined them with the Originals in the proper Offices in Ireland." Sir J. Cunyngham against Capt. Chalmer & al. And those for the Appellant were directed to apply themselves, in the First Place, to that Part of the Appeal which complains, "That the said Earls of Loudoun and Stair, and Colonel Dalrymple, were not Parties in the Cause in the Court of Session in Scotland." It is Ordered, That the said Appeal, as to the said Earls of Loudoun and Stair and Colonel Dalrymple, be, and is hereby, dismissed this House. Ordered, That the further Hearing of this Cause be adjourned till To-morrow; and that the Counsel be called in at One o'Clock. Dominus Cancellarius declaravit præsens Parliamentum continuandum esse usque ad et in diem Martis, vicesimum quintum diem instantis Martii, hora undecima Auroræ, Dominis sic decernentibus. Hodie 2a vice lecta est Billa, intituled, "An Act to give further Powers to the Commissioners for building a Bridge cross the River Thames, from the City of Westminster, to the opposite Shore in the County of Surrey; and to enable them to raise a further Sum of Money, towards finishing the said Bridge, and to perform the other Trusts reposed in them." Ordered, That the said Bill be committed to a Committee of the whole House, on Friday next. 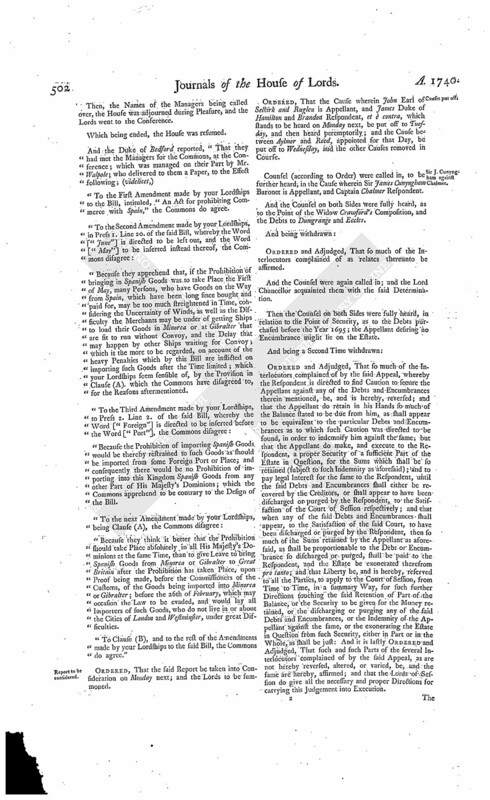 With a Bill, intituled, "An Act for granting to His Majesty the Sum of One Million, out of the Sinking Fund, for the Service of the Year One Thousand Seven Hundred and Forty; and for enabling His Majesty to raise the further Sum of Two Hundred Thousand Pounds, out of the growing Produce of the said Fund; and for granting to His Majesty the Sum of Twenty-one Thousand Pounds, One Shilling, and Eight Pence Half-penny, remaining in the Receipt of His Majesty's Exchequer, arisen by Sale of Lands in the Island of St. Christophers; and for the further appropriating the Supplies granted in this Session of Parliament;" to which they desire the Concurrence of this House. Hodie 3a vice lecta est Billa, intituled, "An Act for vesting the Inheritance of Part of the Estate of George late Earl of Halifax, deceased, in Trustees, for Payment of his Debts, Daughters Portions, and Legacies." Hodie 3a vice lecta est Billa, intituled, "An Act for exchanging several Lands and Grounds, belonging to Thomas Inwen Esquire, in the Parish of Wootton, in the County of Bedford, for other Lands, of equal Value, in the same Parish, belonging to the Master, Fellows, and Scholars, of Sidney Sussex College, in Cambridge." Hodie 3a vice lecta est Billa, intituled, "An Act for confirming and enlarging the Powers granted by His Majesty to the Governors and Guardians of the Hospital for the Maintenance and Education of exposed and deserted young Children, by His most Gracious Charter, bearing Date the Seventeenth Day of October in the Year of Our Lord One Thousand Seven Hundred and Thirty-nine; and to enable them to execute the good Purposes of the said Charter." Messages to H. C. with the Three preceding Bills. To carry down the Three last mentioned Bills, and desire their Concurrence to them. Sir J. Cunyngham against Captain Chalmer. Counsel (according to Order) were called in, to be further heard, in the Cause wherein Sir James Cunyngham Baronet is Appellant, and Captain John Chalmer is Respondent. And the Counsel on both Sides having been fully heard, as to the Point insisted on by the Appellant, That the Proofs taken before the Arbiters ought not to have been admitted as Evidence in this Cause in the Court of Session:"
It is Declared, That the said Proofs taken under the Submission to Arbiters, having been in some Measure authorized by the said Court, by granting Diligence for summoning the Witnesses to be examined before the Sheriff of Air, and the Appellant's having acquiesced so long under the Interlocutors touching this Point, the said Interlocutors, so far as they relate thereto, ought to be affirmed: And it is therefore Ordered and Adjudged, That the same be affirmed. Then the Counsel were called in again; and the Lord Chancellor acquainted them with what the House had determined. They were a Second Time directed to withdraw. Ordered and Adjudged, That so much of the Interlocutors complained of, whereby the following Additions were ordered or allowed to be made to the said Rental; (videlicet,) "Forty Merks Scots in respect of the Farm called Barnhill and Briggs, Six Pounds Scots in respect to the Farm called Know, and One Boll of Victual in respect of the Farm called Craigstoun," be reversed. Then the Counsel were the Third Time called in; and acquainted by the Lord Chancellor with what the House had determined. Ordered, That the further Hearing of this Cause be adjourned till To-morrow; and the Counsel to be called in at One o'Clock; and that the Cause appointed to be heard on that Day be put off to Monday next; and the other Causes on Cause-days removed in Course. Hodie 2a vice lecta est Billa, "intituled, An Act for dividing and enclosing the Common Fields, in the Parish of Stivichall, alias Stichall, in the County of the City of Coventry." Vis. Fauconberg. L. Bp. Rochester. L. B. Landaff. L. Abergavenny. Their Lordships, or any Five of them; to meet on Wednesday the 9th Day of April next, at the usual Time and Place; and to adjourn as they please. Dominus Cancellarius declaravit præsens Parliamentum continuandum esse usque ad et in diem Mercurii, vicesimum sextum diem instantis Martii, hora undecima Auroræ, Dominis sic decernentibus. Hodie 2a vice lecta est Billa, intituled, "An Act for granting to His Majesty the Sum of One Million, out of the Sinking Fund, for the Service of the Year One Thousand Seven Hundred and Forty; and for enabling His Majesty to raise the further Sum of Two Hundred Thousand Pounds, out of the growing Produce of the said Fund; and for granting to His Majesty the Sum of Twenty-one Thousand Pounds, One Shilling, and Eight Pence Half-penny, remaining in the Receipt of His Majesty's Exchequer, arisen by Sale of Lands in the Island of Saint Christophers; and for the further appropriating the Supplies granted in this Session of Parliament." Hodie 3a vice lecta est Billa, intituled, "An Act for enlarging the Term and Powers granted and given by an Act passed in the Tenth Year of the Reign of His late Majesty King George the First, intituled, "An Act for repairing the Road leading from Dunchurch, in the County of Warwick, to the Bottom of Meriden Hill, in the same County;" and for making the said Act more effectual." Hodie 3a vice lecta est Billa, intituled, "An Act for continuing and making more effectual an Act, passed in the Fifth Year of the Reign of His late Majesty King George the First, for repairing the Roads from the Top of Stoken Church Hill to Enslow Bridge, and the Road from Wheatly Bridge, through the City of Oxon, by Begbrook, to New Woodstock, in the County of Oxon (except the Mile Way on each Side the said City); and for repairing the Road from The Crown Alehouse to the Turnpike on Stoken Church Hill aforesaid." To acquaint them, that the Lords have agreed to the Two last mentioned Bills, without any Amendment. Hodie 1a vice lecta est Billa, intituled, "An Act to continue several Laws therein mentioned, for punishing such Persons as shall wilfully and maliciously pull down or destroy Turnpikes for repairing Highways, or Locks or other Works erected by Authority of Parliament for making Rivers navigable; for preventing Exactions of the Occupiers of Locks and Wears upon the River of Thames Westward; and for ascertaining the Rates of Water Carriage upon the said River; for preventing frivolous and vexatious Arrests; and for better securing the lawful Trade of His Majesty's Subjects to and from The East Indies, and for the more effectual preventing all His Majesty's Subjects trading thither under Foreign Commissions; and for limiting the Time for suing forth Writs of Certiorari upon Proceedings before Justices of the Peace, and for regulating the Time and Manner of applying for the same; for the better and more speedy Execution of Process within particular Franchises or Liberties; and for extending the Power and Authorities of Justices of the Peace of Counties, touching County Rates, to the Justices of the Peace of such Liberties and Franchises as have Commissions of the Peace within themselves." 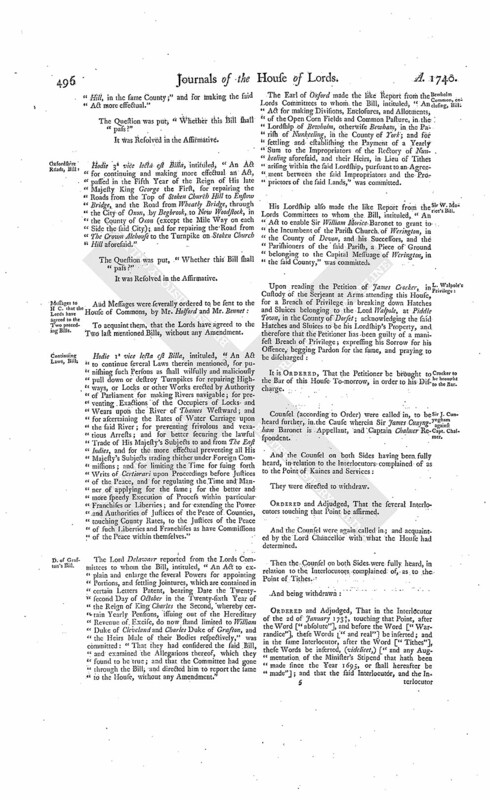 The Lord Delawarr reported from the Lords Committees to whom the Bill, intituled, "An Act to explain and enlarge the several Powers for appointing Portions, and settling Jointures, which are contained in certain Letters Patent, bearing Date the Twentysecond Day of October in the Twenty-sixth Year of the Reign of King Charles the Second, whereby certain Yearly Pensions, issuing out of the Hereditary Revenue of Excise, do now stand limited to William Duke of Cleveland and Charles Duke of Grafton, and the Heirs Male of their Bodies respectively," was committed: "That they had considered the said Bill, and examined the Allegations thereof, which they found to be true; and that the Committee had gone through the Bill, and directed him to report the same to the House, without any Amendment." The Earl of Oxford made the like Report from the Lords Committees to whom the Bill, intituled, "An Act for making Divisions, Enclosures, and Allotments, of the Open Corn Fields and Common Pasture, in the Lordship of Bewholm, otherwise Bewham, in the Parish of Nunkeeling, in the County of York; and for settling and establishing the Payment of a Yearly Sum to the Impropriators of the Rectory of Nunkeeling aforesaid, and their Heirs, in Lieu of Tithes arising within the said Lordship, pursuant to an Agreement between the said Impropriators and the Proprietors of the said Lands," was committed. His Lordship also made the like Report from the Lords Committees to whom the Bill, intituled, "An Act to enable Sir William Morice Baronet to grant to the Incumbent of the Parish Church of Werington, in the County of Devon, and his Successors, and the Parishioners of the said Parish, a Piece of Ground belonging to the Capital Messuage of Werington, in the said County," was committed. Crocker to be brought to the Bar. It is Ordered, That the Petitioner be brought to the Bar of this House To-morrow, in order to his Discharge. Sir J. Cunyngham against Capt. Chalmer. Counsel (according to Order) were called in, to be heard further, in the Cause wherein Sir James Cunyngham Baronet is Appellant, and Captain Chalmer Respondent. They were directed to withdraw. Ordered and Adjudged, That the several Interlocutors touching that Point be affirmed. And the Counsel were again called in; and acquainted by the Lord Chancellor with what the House had determined. Then the Counsel on both Sides were fully heard, in relation to the Interlocutors complained of, as to the Point of Tithes. Ordered and Adjudged, That in the Interlocutor of the 2d of January 1734/5, touching that Point, after the Word ["absolute"], and before the Word ["Warrandice"], these Words ["and real"] be inserted; and in the same Interlocutor, after the Word ["Tithes"], these Words be inserted, (videlicet,) ["and any Augmentation of the Minister's Stipend that hath been made since the Year 1695, or shall hereafter be made"]; and that the said Interlocutor, and the In terlocutor of the 24th of June 1735, adhering thereto, with these Additions and Variations, be affirmed. And the Counsel were the Third Time called in; and acquainted by the Lord Chancellor with the Determination of the House. Then the Counsel on both Sides were fully heard, as to the Point of the Appellant's giving in a Particular of the Debts and Encumbrances acquired by his Father and himself, by Way of Discharge. Ordered and Adjudged, That so much of the Interlocutors complained of, as relate to the Debt of 2,000 Merks due upon Bond to The Trinity Hospital in Edinburgh, be affirmed. And the Counsel were the Fourth Time called in; and acquainted by the Lord Chancellor with the said Determination. Ordered, That the further Hearing of this Cause be adjourned till To-morrow; and the Counsel to be called in at One o'Clock. The Earl of Findlater reported from the Lords Committees to whom the Bill, intituled, "An Act for confirming and establishing Articles of Agreement, and an Award, for dividing and enclosing of a Common Down; and for dividing, enclosing, and exchanging of Lands, lying in the Tithing, of Charlton, in the Parish of Andover, in the County of Southampton," was committed: "That they had considered the said Bill, and examined the Allegations thereof, which they found to be true; that the Parties concerned had given their Consents; and that the Committee had gone through the Bill, and made some Amendments thereunto." Dominus Cancellarius declaravit præsens Parliamentum continuandum esse usque ad et in diem Jovis, vicesimum septimum diem instantis Martii, hora undecima Auroræ, Dominis sic decernentibus. The Earl of Halifax reported from the Lords Committees to whom the Bill, intituled, "An Act for selling Part of the settled Estate of Henry Talbot Esquire, in the Counties of Warwick and Derby; and for settling another Estate, in the County of Rutland, of greater Value, to the same Uses," was committed: "That they had considered the said Bill, and examined the Allegations thereof, which they found to be true; that the Parties concerned had given their Consents; and that the Committee had gone through the Bill, and made some Amendments thereunto." Hodie 3a vice lecta est Billa, intituled, "An Act for making Divisions, Enclosures, and Allotments, of the Open Corn Fields and Common Pasture, in the Lordship of Bewholm, otherwise Bewham, in the Parish of Nunkeeling, in the County of York; and for settling and establishing the Payment of a Yearly Sum to the Impropriators of the Rectory of Nunkeeling aforesaid, and their Heirs, in Lieu of Tithes arising within the said Lordship, pursuant to an Agreement between the said Impropriators and the Proprietors of the said Lands." Hodie 3a vice lecta est Billa, intituled, "An Act to enable Sir William Morrice Baronet to grant to the Incumbent of the Parish Church of Werington, in the County of Devon, and his Successors, and the Parishioners of the said Parish, a Piece of Ground belonging to the Capital Messuage of Werington, in the said County." Hodie 3a vice lecta est Billa, intituled, "An Act to explain and enlarge the several Powers, for appointing Portions, and settling Jointures, which are contained in certain Letters Patent, bearing Date the Twenty-second Day of October in the Twenty-sixth Year of the Reign of King Charles the Second, whereby certain Yearly Pensions, issuing out of the Hereditary Revenue of Excise, do now stand limited to William Duke of Cleveland and Charles Duke of Grafton, and the Heirs Male of their Bodies respectively." Message to H. C. that the Lords have agreed to the Three preceding Bills. To acquaint them, that the Lords have agreed to the Three last mentioned Bills, without any Amendment. Fraudulent Qualifications to vote for Members, to prevent, Bill. With a Bill, intituled, "An Act for the more effectually preventing fraudulent Qualifications of Persons to vote as Freeholders, in the Election of Members to serve in Parliament, for such Cities and Towns as are Counties of themselves, in that Part of Great Britain called England;" to which they desire the Concurrence of this House. With a Bill, intituled, "An Act for the more effectual Maintenance and Well-keeping of Staines Bridge and Egham Causeway, being the Highway from London to the West Parts of England;" to which they desire the Concurrence of this House. Hodie 3a vice lecta est Billa, intituled, "An Act for confirming and establishing Articles of Agreement, and an Award for dividing and enclosing of a Common Down; and for dividing, enclosing, and exchanging of Lands, lying in the Tithing of Charlton, in the Parish of Andover, in the County of Southampton." Message to H. C. with Amendments to it. To acquaint them, that the Lords have agreed to the same, with some Amendments, whereunto their Lordships desire their Concurrence. State of the Nation, Consideration put off. It was moved, "That the same be put off to Monday next." It was likewise moved, "To put off the Consideration of that Matter to the First Tuesday after the approaching Recess." The Question was put, upon the First Motion. And it was Resolved in the Negative. Ordered, That this House will take into Consideration the State of the Nation, on the First Tuesday after the approaching Recess; and the Lords to be summoned. 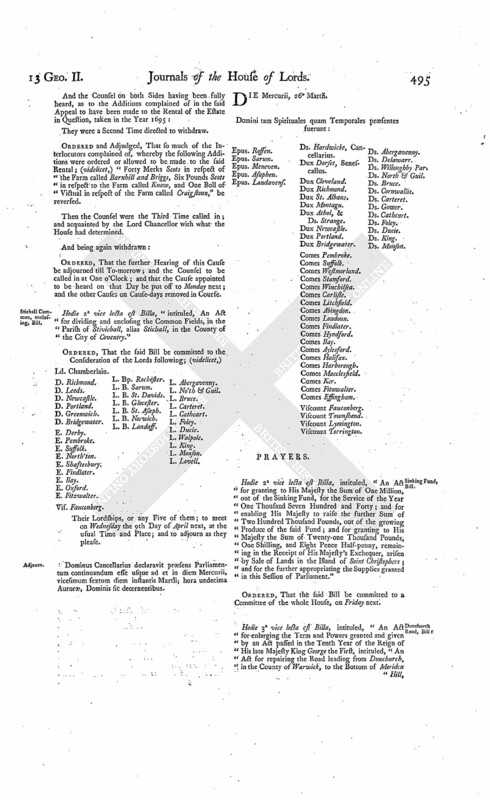 The next Order of the Day being read, for the House to be in a Committee on the Bill, intituled, "An Act for amending and enforcing the Laws relating to Rogues, Vagabonds, and other idle and disorderly Persons, and for reducing the same into One Act of Parliament; and also for amending the Laws for erecting, providing, and regulating, Houses of Correction:"
Ordered, That the House be put into a Committee thereupon, on Wednesday next. Message from H. C. for a Conference on the Amendments to the Bill for prohibiting Commerce with Spain. To desire a Conference with this House, upon the Subject-matter of the Amendments made by their Lord ships to the Bill, intituled, "An Act for prohibiting Commerce with Spain." To which the House agreed. And the Messengers were called in; and told, "That the Lords do agree to a Conference, as is desired; and appoint the same To-morrow, at Two o'Clock, in the Painted Chamber." Sir J. Cunyngham against Chalmer. Counsel (according to Order) were called in, to be further heard, in the Cause wherein Sir James Cunyngham Baronet is Appellant, and Captain Chalmer Respondent. And the Counsel on both Sides were fully heard, as to Sums contained in a Decree of Apprizing, obtained by Gordon of Craighlow, as Trustee for the Respondent's Grandfather, against the Family of Loudoun. Ordered and Adjudged, That so much of the Interlocutors complained of, as relates to the said Sums, be affirmed. And the Counsel were again called in; and acquainted by the Lord Chancellor with the said Determination. Then the Counsel on both Sides were fully heard, as to the Debts of Ferguson of Castlehill, David and Roger Dun, Shaw of Nether Grimmet, and Campbell of Nether Place. Ordered and Adjudged, That so much of the Interlocutors as relates to the said Debts be affirmed. And the Counsel were the Third Time called in: and the Lord Chancellor acquainted them with that Determination. Then the Counsel on both Sides were fully heard, as to a Debt of £.8524 Scots, of William Chalmer. Ordered and Adjudged, That so much of the Interlocutors as relates to that Debt be affirmed. And the Counsel were the Fourth Time called in; and acquainted by the Lord Chancellor with that Determination. Then the Counsel on both Sides were fully heard, as to the Rule prescribed for ascertaining Abatements on the Debts purchased. Ordered and Adjudged, That so much of the Interlocutors, as relate to the Medium established for the Calculation of those Debts, be affirmed. And the Counsel, being a Fifth Time called in, were acquainted by the Lord Chancellor with the said Determination. Ordered, That the further Hearing of this Cause be adjourned till To-morrow. Ld. Walpole's Privilege; Croker discharged. James Croker, in Custody of the Serjeant at Arms attending this House, for a Breach of Privilege, in breaking down certain Hatches or Sluices belonging to the Lord Walpole, was (according to Order) brought to the Bar; where he (on his Knees) receiving a Reprimand from the Lord Chancellor for his said Offence, was ordered to be discharged out of Custody, paying his Fees. Dominus Cancellarius declaravit præsens Parliamentum continuandum esse usque ad et in diem Veneris, vicesimum octavum diem instantis Martii, hora undecima Auroræ, Dominis sic decernentibus. With a Bill, intituled, "An Act for the Increase of Mariners and Seamen, to navigate Merchant Ships, and other Trading Ships or Vessels;" to which they desire the Concurrence of this House. 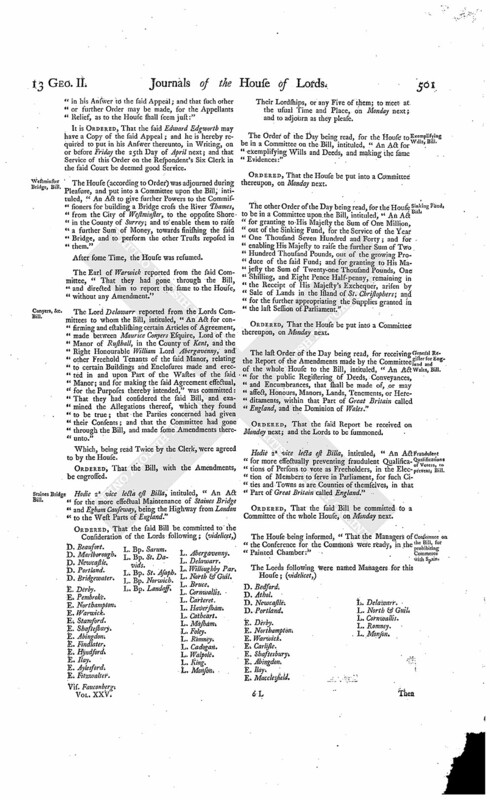 With a Bill, intituled, "An Act to revive, explain, and amend, an Act made in the Sixteenth and Seventeenth Years of the Reign of His late Majesty King Charles the Second, intituled, An Act for making the River Medway navigable, in the Counties of Kent and Sussex;" to which they desire the Concurrence of this House. The said Two Bills were read the First Time. "An Account of what Bills of Credit have from Time to Time been admitted, in this His Majesty's Colony of New York, pursuant to the several Acts of the General Assembly of the said Colony; and how much of the said Bills have been sunk." "An Account of the Value of Money in New York, from the Year 1700, to the Year 1739." "Report of the Committee of Council, concerning the Paper Currency, and the Value of Gold and Silver Coin." "An Account of the Bills of Credit made and issued by the Government of the Province of The Massachusets Bay, for the Support of the said Government, from the Year 1700, to the Year 1738; and of the Provision made for the sinking and discharging of such Bills on their Emission, by Taxes upon Polls and Estates, and the Duties of Impost and Excise." "Account of Province Bills, made by Order of the General Court, and delivered to the Treasurer of the Province, for which also he gives Credit in the several Years set against the Sums; also an Account of what Bills have been burnt, with the Times when, and the Price of Silver and Exchange." "An Account of the Paper Currency in New Hampshire in New England, and of the Rate of Silver." "An Account of the several Acts passed in the Province of Pennsylvania, for creating or issuing Paper Bills, or Bills of Credit; with the Amount of those Bills, and the Value thereof in Money of Great Britain, and the Provision made for sinking or discharging the same, together with the Sum of Bills that have been sunk or discharged; also the Sum of Bills subsisting, or passing in Payment at this Time, with the Amount of the Value thereof in Money of Great Britain, and of the Rates of Gold and Silver." 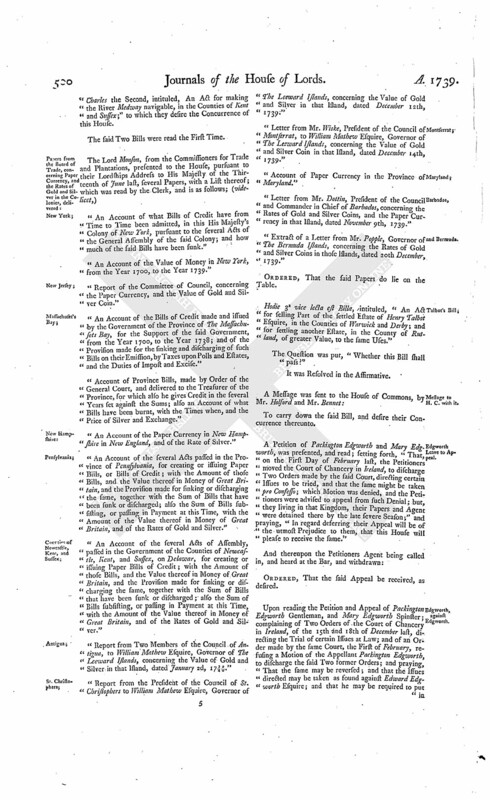 "An Account of the several Acts of Assembly, passed in the Government of the Counties of Newcastle, Kent, and Sussex, on Delawar, for creating or issuing Paper Bills of Credit; with the Amount of those Bills, and the Value thereof in Money of Great Britain, and the Provision made for sinking or discharging the same, together with the Sum of Bills that have been sunk or discharged; also the Sum of Bills subsisting, or passing in Payment at this Time, with the Amount of the Value thereof in Money of Great Britain, and of the Rates of Gold and Silver." "Report from Two Members of the Council of Antigua, to William Mathew Esquire, Governor of The Leeward Islands, concerning the Value of Gold and Silver in that Island, dated January 2d, 1739/40." "Report from the President of the Council of St. Christophers to William Mathew Esquire, Governor of The Leeward Islands, concerning the Value of Gold and Silver in that Island, dated December 12th, 1739." "Letter from Mr. Wiske, President of the Council of Montserrat, to William Mathew Esquire, Governor of The Leeward Islands, concerning the Value of Gold and Silver Coin in that Island, dated December 14th, 1739." "Account of Paper Currency in the Province of Maryland." "Letter from Mr. Dottin, President of the Council and Commander in Chief of Barbados, concerning the Rates of Gold and Silver Coins, and the Paper Currency in that Island, dated November 9th, 1739." "Extract of a Letter from Mr. Popple, Governor of The Bermuda Islands, concerning the Rates of Gold and Silver Coins in those Islands, dated 20th December, 1739." Hodie 3a vice lecta est Billa, intituled, "An Act for selling Part of the settled Estate of Henry Talbot Esquire, in the Counties of Warwick and Derby; and for settling another Estate, in the County of Rutland, of greater Value, to the same Uses." 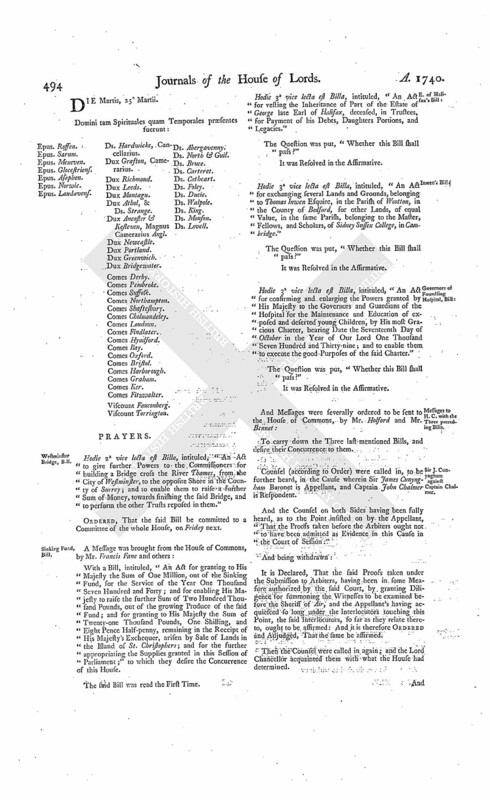 A Petition of Packington Edgworth and Mary Edgworth, was presented, and read; setting forth, "That, on the First Day of February last, the Petitioners moved the Court of Chancery in Ireland, to discharge Two Orders made by the said Court, directing certain Issues to be tried, and that the same might be taken pro Confesso; which Motion was denied, and the Petitioners were advised to appeal from such Denial; but, they living in that Kingdom, their Papers and Agent were detained there by the late severe Season;" and praying, "In regard deferring their Appeal will be of the utmost Prejudice to them, that this House will please to receive the same." Ordered, That the said Appeal be received, as desired. Upon reading the Petition and Appeal of Packington Edgworth Gentleman, and Mary Edgworth Spinster; complaining of Two Orders of the Court of Chancery in Ireland, of the 15th and 18th of December last, directing the Trial of certain Issues at Law; and of an Order made by the same Court, the First of February, refusing a Motion of the Appellant Packington Edgworth, to discharge the said Two former Orders; and praying, "That the same may be reversed; and that the Issues directed may be taken as found against Edward Edgworth Esquire; and that he may be required to put in his Answer to the said Appeal; and that such other or further Order may be made, for the Appellants Relief, as to the House shall seem just:"
It is Ordered, That the said Edward Edgworth may have a Copy of the said Appeal; and he is hereby required to put in his Answer thereunto, in Writing, on or before Friday the 25th Day of April next; and that Service of this Order on the Respondent's Six Clerk in the said Court be deemed good Service. 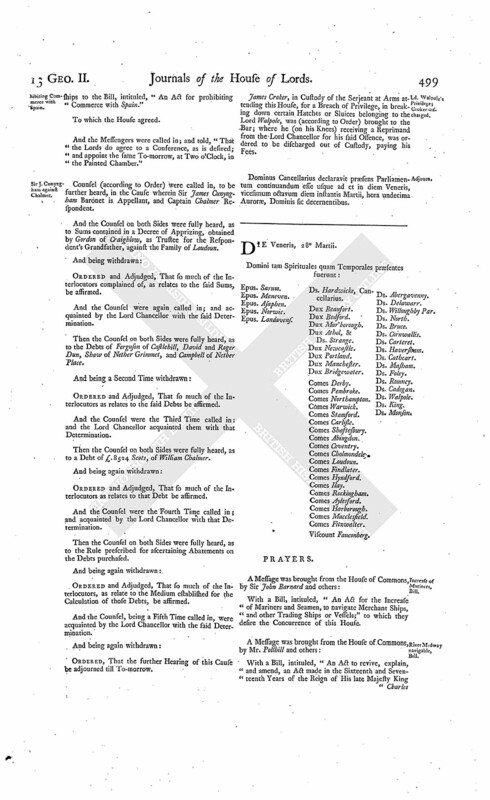 The House (according to Order) was adjourned during Pleasure, and put into a Committee upon the Bill, intituled, "An Act to give further Powers to the Commissioners for building a Bridge cross the River Thames, from the City of Westminster, to the opposite Shore in the County of Surrey; and to enable them to raise a further Sum of Money, towards finishing the said Bridge, and to perform the other Trusts reposed in them." The Earl of Warwick reported from the said Committee, "That they had gone through the Bill, and directed him to report the same to the House, without any Amendment." 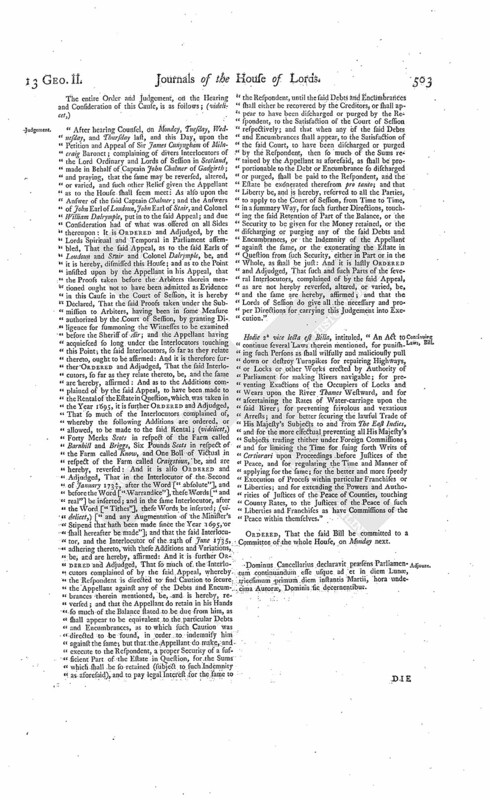 The Lord Delawarr reported from the Lords Committees to whom the Bill, intituled, "An Act for confirming and establishing certain Articles of Agreement, made between Maurice Conyers Esquire, Lord of the Manor of Rusthall, in the County of Kent, and the Right Honourable William Lord Abergavenny, and other Freehold Tenants of the said Manor, relating to certain Buildings and Enclosures made and erected in and upon Part of the Wastes of the said Manor; and for making the said Agreement effectual, for the Purposes thereby intended," was committed: That they had considered the said Bill, and examined the Allegations thereof, which they found to be true; that the Parties concerned had given their Consents; and that the Committee had gone through the Bill, and made some Amendments thereunto." Hodie 2a vice lecta est Billa, intituled, "An Act for the more effectual Maintenance of Staines Bridge and Egham Causeway, being the Highway from London to the West Parts of England." Vis. Fauconberg. L. Bp. Sarum. L. Bp. Landaff. L. Abergavenny. The Order of the Day being read, for the House to be in a Committee on the Bill, intituled, "An Act for exemplifying Wills and Deeds, and making the same Evidences:"
Ordered, That the House be put into a Committee thereupon, on Monday next. 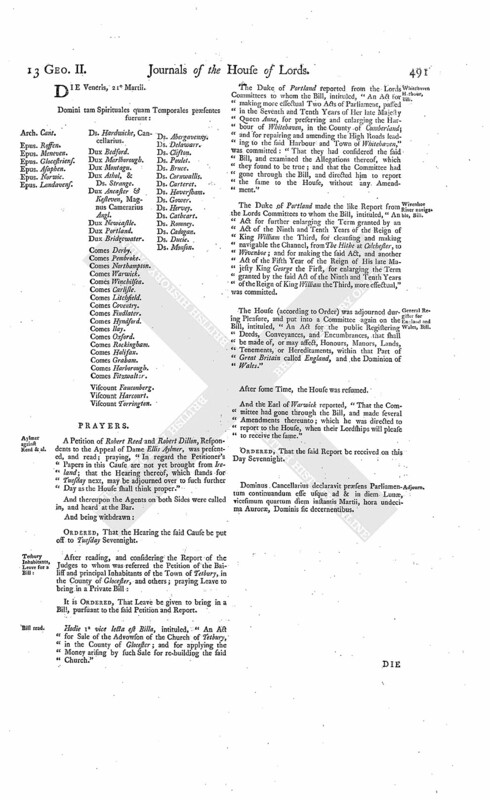 The other Order of the Day being read, for the House to be in a Committee upon the Bill, intituled, "An Act for granting to His Majesty the Sum of One Million, out of the Sinking Fund, for the Service of the Year One Thousand Seven Hundred and Forty; and for enabling His Majesty to raise the further Sum of Two Hundred Thousand Pounds, out of the growing Produce of the said Fund; and for granting to His Majesty the Sum of Twenty-one Thousand Pounds, One Shilling, and Eight Pence Half-penny, remaining in the Receipt of His Majesty's Exchequer, arisen by Sale of Lands in the Island of St. Christophers; and for the further appropriating the Supplies granted in the last Session of Parliament." 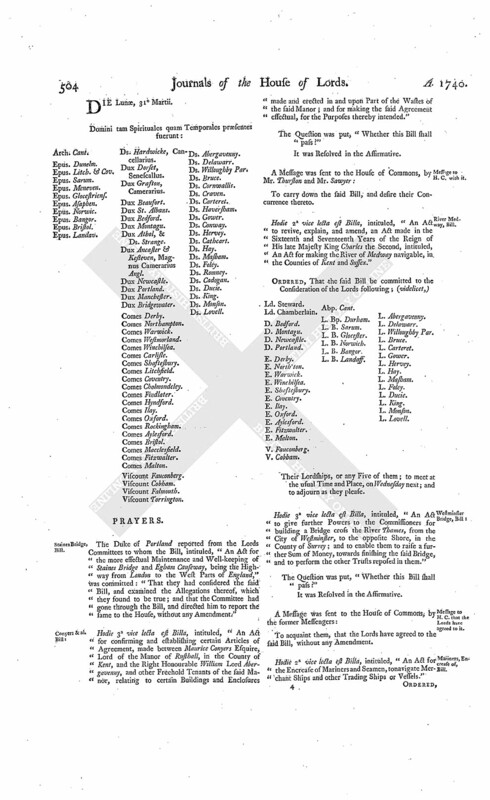 The last Order of the Day being read, for receiving the Report of the Amendments made by the Committee of the whole House to the Bill, intituled, "An Act for the public Registering of Deeds, Conveyances, and Encumbrances, that shall be made of, or may affect, Honours, Manors, Lands, Tenements, or Hereditaments, within that Part of Great Britain called England, and the Dominion of Wales." Ordered, That the said Report be received on Monday next; and the Lords to be summoned. Fraudulent Qualifications of Voters, to prevent, Bill. Hodie 2a vice lecta est Billa, intituled, "An Act for more effectually preventing fraudulent Qualifications of Persons to vote as Freeholders, in the Election of Members to serve in Parliament, for such Cities and Towns as are Counties of themselves, in that Part of Great Britain called England." Ordered, That the said Bill be committed to a Committee of the whole House, on Monday next. Conference on the Bill, for prohibiting Commerce with Spain. The House being informed, "That the Managers of the Conference for the Commons were ready, in the Painted Chamber:"
Then, the Names of the Managers being called over, the House was adjourned during Pleasure, and the Lords went to the Conference. Which being ended, the House was resumed. "To the First Amendment made by your Lordships to the Bill, intituled, "An Act for prohibiting Commerce with Spain," the Commons do agree. "Because they apprehend that, if the Prohibition of bringing in Spanish Goods was to take Place the First of May, many Persons, who have Goods on the Way from Spain, which have been long since bought and paid for, may be too much streightened in Time, considering the Uncertainty of Winds, as well as the Difficulty the Merchants may be under of getting Ships to load their Goods in Minorca or at Gibralter that are fit to run without Convoy, and the Delay that may happen by other Ships waiting for Convoy; which is the more to be regarded, on account of the heavy Penalties which by this Bill are inflicted on importing such Goods after the Time limited; which your Lordships seem sensible of, by the Provision in Clause (A). which the Commons have disagreed to, for the Reasons aftermentioned. "Because the Prohibition of importing Spanish Goods would be thereby restrained to such Goods as should be imported from some Foreign Port or Place; and consequently there would be no Prohibition of importing into this Kingdom Spanish Goods from any other Part of His Majesty's Dominions; which the Commons apprehend to be contrary to the Design of the Bill. "Because they think it better that the Prohibition should take Place absolutely in all His Majesty's Dominions at the same Time, than to give Leave to bring Spanish Goods from Minorca or Gibralter to Great Britain after the Prohibition has taken Place, upon Proof being made, before the Commissioners of the Customs, of the Goods being imported into Minorca or Gibralter; before the 26th of February, which may occasion the Law to be evaded, and would lay all Importers of such Goods, who do not live in or about the Cities of London and Westminster, under great Difficulties. "To Clause (B), and to the rest of the Amendments made by your Lordships to the said Bill, the Commons do agree." Ordered, That the said Report be taken into Consideration on Monday next; and the Lords to be summoned. Ordered, That the Cause wherein John Earl of Selkirk and Ruglen is Appellant, and James Duke of Hamilton and Brandon Respondent, et è contra, which stands to be heard on Monday next, be put off to Tuesday, and then heard peremptorily; and the Cause between Aylmer and Reed, appointed for that Day, be put off to Wednesday, and the other Causes removed in Course. And the Counsel on both Sides were fully heard, as to the Point of the Widow Crawford's Composition, and the Debts to Dumgrange and Eccles. Ordered and Adjudged, That so much of the Interlocutors complained of as relates thereunto be affirmed. And the Counsel were again called in; and the Lord Chancellor acquainted them with the said Determination. Then the Counsel on both Sides were fully heard, in relation to the Point of Security, as to the Debts purchased before the Year 1695; the Appellant desiring no Encumbrance might lie on the Estate. Ordered and Adjudged, That so much of the Interlocutors complained of by the said Appeal, whereby the Respondent is directed to find Caution to secure the Appellant against any of the Debts and Encumbrances therein mentioned, be, and is hereby, reversed; and that the Appellant do retain in his Hands so much of the Balance stated to be due from him, as shall appear to be equivalent to the particular Debts and Encumbrances as to which such Caution was directed to be found, in order to indemnify him against the same; but that the Appellant do make, and execute to the Respondent, a proper Security of a sufficient Part of the Estate in Question, for the Sums which shall be so retained (subject to such Indemnity as aforesaid); and to pay legal Interest for the same to the Respondent, until the said Debts and Encumbrances shall either be recovered by the Creditors, or shall appear to have been discharged or purged by the Respondent, to the Satisfaction of the Court of Session respectively; and that when any of the said Debts and Encumbrances shall appear, to the Satisfaction of the said Court, to have been discharged or purged by the Respondent, then so much of the Sums retained by the Appellant as aforesaid, as shall be proportionable to the Debt or Encumbrance so discharged or purged, shall be paid to the Respondent, and the Estate be exonerated therefrom pro tanto; and that Liberty be, and is hereby, reserved to all the Parties, to apply to the Court of Session, from Time to Time, in a summary Way, for such further Directions touching the said Retention of Part of the Balance, or the Security to be given for the Money retained, or the discharging or purging any of the said Debts and Encumbrances, or the Indemnity of the Appellant against the same, or the exonerating the Estate in Question from such Security, either in Part or in the Whole, as shall be just: And it is lastly Ordered and Adjudged, That such and such Parts of the several Interlocutors complained of by the said Appeal, as are not hereby reversed, altered, or varied, be, and the same are hereby, affirmed; and that the Lords of Session do give all the necessary and proper Directions for carrying this Judgement into Execution. "After hearing Counsel, on Monday, Tuesday, Wednesday, and Thursday last, and this Day, upon the Petition and Appeal of Sir James Cunyngham of Milncraig Baronet; complaining of divers Interlocutors of the Lord Ordinary and Lords of Session in Scotland, made in Behalf of Captain John Chalmer of Gadgirth; and praying, that the same may be reversed, altered, or varied, and such other Relief given the Appellant as to the House shall seem meet: As also upon the Answer of the said Captain Chalmer; and the Answers of John Earl of Loudoun, John Earl of Stair, and Colonel William Dalrymple, put in to the said Appeal; and due Consideration had of what was offered on all Sides thereupon: It is Ordered and Adjudged, by the Lords Spiritual and Temporal in Parliament assembled, That the said Appeal, as to the said Earls of Loudoun and Stair and Colonel Dalrymple, be, and it is hereby, dismissed this House; and as to the Point insisted upon by the Appellant in his Appeal, that the Proofs taken before the Arbiters therein mentioned ought not to have been admitted as Evidence in this Cause in the Court of Session, it is hereby Declared, That the said Proofs taken under the Submission to Arbiters, having been in some Measure authorized by the Court of Session, by granting Diligence for summoning the Witnesses to be examined before the Sheriff of Air; and the Appellant having acquiesced so long under the Interlocutors touching this Point; the said Interlocutors, so far as they relate thereto, ought to be affirmed: And it is therefore further Ordered and Adjudged, That the said Interlocutors, so far as they relate thereto, be, and the same are hereby, affirmed: And as to the Additions complained of by the said Appeal, to have been made to the Rental of the Estate in Question, which was taken in the Year 1695, it is further Ordered and Adjudged, That so much of the Interlocutors complained of, whereby the following Additions are ordered, or allowed, to be made to the said Rental; (videlicet,) Forty Merks Scots in respect of the Farm called Barnhill and Briggs, Six Pounds Scots in respect of the Farm called Know, and One Boll of Victual in respect of the Farm called Craigstoun, be, and are hereby, reversed: And it is also Ordered and Adjudged, That in the Interlocutor of the Second of January 1734/5, after the Word ["absolute"], and before the Word ["Warrandice"], these Words ["and real"] be inserted; and in the same Interlocutor, after the Word ["Tithes"], these Words be inserted; (videlicet,) ["and any Augmentation of the Minister's Stipend that hath been made since the Year 1695, or shall hereafter be made"]; and that the said Interlocutor, and the Interlocutor of the 24th of June 1735, adhering thereto, with these Additions and Variations, be, and are hereby, affirmed: And it is further Ordered and Adjudged, That so much of the Interlocutors complained of by the said Appeal, whereby the Respondent is directed to find Caution to secure the Appellant against any of the Debts and Encumbrances therein mentioned, be, and is hereby, reversed; and that the Appellant do retain in his Hands so much of the Balance stated to be due from him, as shall appear to be equivalent to the particular Debts and Encumbrances, as to which such Caution was directed to be found, in order to indemnify him against the same; but that the Appellant do make, and execute to the Respondent, a proper Security of a sufficient Part of the Estate in Question, for the Sums which shall be so retained (subject to such Indemnity as aforesaid), and to pay legal Interest for the same to the Respondent, until the said Debts and Encumbrances shall either be recovered by the Creditors, or shall appear to have been discharged or purged by the Respondent, to the Satisfaction of the Court of Session respectively; and that when any of the said Debts and Encumbrances shall appear, to the Satisfaction of the said Court, to have been discharged or purged by the Respondent, then so much of the Sums retained by the Appellant as aforesaid, as shall be proportionable to the Debt or Encumbrance so discharged or purged, shall be paid to the Respondent, and the Estate be exonerated therefrom pro tanto; and that Liberty be, and is hereby, reserved to all the Parties, to apply to the Court of Session, from Time to Time, in a summary Way, for such further Directions, touching the said Retention of Part of the Balance, or the Security to be given for the Money retained, or the discharging or purging any of the said Debts and Encumbrances, or the Indemnity of the Appellant against the same, or the exonerating the Estate in Question from such Security, either in Part or in the Whole, as shall be just: And it is lastly Ordered and Adjudged, That such and such Parts of the several Interlocutors, complained of by the said Appeal, as are not hereby reversed, altered, or varied, be, and the same are hereby, affirmed; and that the Lords of Session do give all the necessary and proper Directions for carrying this Judgement into Execution." Hodie 2a vice lecta est Billa, intituled, "An Act to continue several Laws therein mentioned, for punishing such Persons as shall wilfully and maliciously pull down or destroy Turnpikes for repairing Highways, or Locks or other Works erected by Authority of Parliament for making Rivers navigable; for preventing Exactions of the Occupiers of Locks and Wears upon the River Thames Westward, and for ascertaining the Rates of Water-carriage upon the said River; for preventing frivolous and vexatious Arrests; and for better securing the lawful Trade of His Majesty's Subjects to and from The East Indies, and for the more effectual preventing all His Majesty's Subjects trading thither under Foreign Commissions; and for limiting the Time for suing forth Writs of Certiorari upon Proceedings before Justices of the Peace, and for regulating the Time and Manner of applying for the same; for the better and more speedy Execution of Process within particular Franchises or Liberties; and for extending the Powers and Authorities of Justices of the Peace of Counties, touching County Rates, to the Justices of the Peace of such Liberties and Franchises as have Commissions of the Peace within themselves." Dominus Cancellarius declaravit præsens Parliamentum continuandum esse usque ad et in diem Lunæ, tricesimum primum diem instantis Martii, hora undecima Auroræ, Dominis sic decernentibus. The Duke of Portland reported from the Lords Committees to whom the Bill, intituled, "An Act for the more effectual Maintenance and Well-keeping of Staines Bridge and Egham Causeway, being the Highway from London to the West Parts of England," was committed: "That they had considered the said Bill, and examined the Allegations thereof, which they found to be true; and that the Committee had gone through the Bill, and directed him to report the same to the House, without any Amendment." Hodie 3a vice lecta est Billa, intituled, "An Act for confirming and establishing certain Articles of Agreement, made between Maurice Conyers Esquire, Lord of the Manor of Rusthall, in the County of Kent, and the Right Honourable William Lord Abergavenny, and other Freehold Tenants of the said Manor, relating to certain Buildings and Enclosures made and erected in and upon Part of the Wastes of the said Manor; and for making the said Agreement effectual, for the Purposes thereby intended." Hodie 2a vice lecta est Billa, intituled, "An Act to revive, explain, and amend, an Act made in the Sixteenth and Seventeenth Years of the Reign of His late Majesty King Charles the Second, intituled, An Act for making the River of Medway navigable, in the Counties of Kent and Sussex." Their Lordships, or any Five of them; to meet at the usual Time and Place, on Wednesday next; and to adjourn as they please. Hodie 3a vice lecta est Billa, intituled, "An Act to give further Powers to the Commissioners for building a Bridge cross the River Thames, from the City of Westminster, to the opposite Shore, in the County of Surrey; and to enable them to raise a further Sum of Money, towards finishing the said Bridge, and to perform the other Trusts reposed in them." Hodie 2a vice lecta est Billa, intituled, "An Act for the Encrease of Mariners and Seamen, tonavigate Merchant Ships and other Trading Ships or Vessels." Ordered, That the said Bill be committed to a Committee of the whole House, on Wednesday next. Message from H. C. to return Charlton Common enclosing Bill. 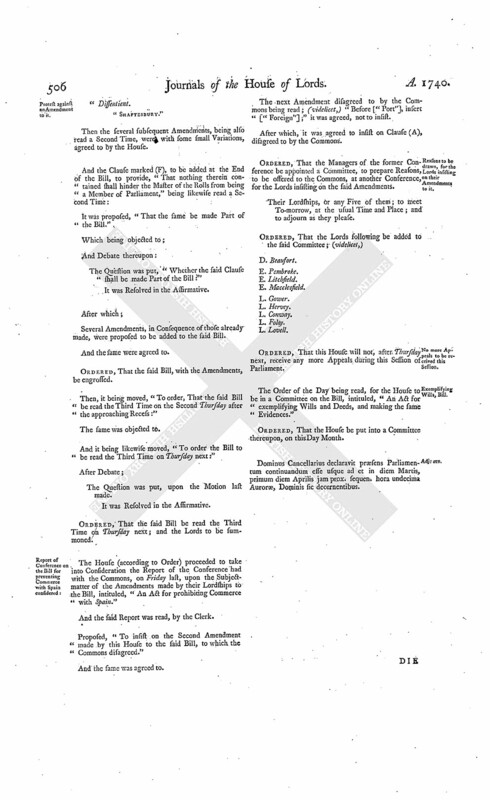 To return the Bill, intituled, "An Act for confirming and establishing Articles of Agreement, and an Award, for dividing and enclosing of a Common Down; and for dividing, enclosing, and exchanging of Lands, lying in the Tithing of Charlton, in the Parish of Andover, in the County of Southampton;" and to acquaint this House, that they have agreed to their Lordships Amendments made thereto. Hartley to enter into Recognizance for Edgworth. The House being moved, "That Thomas Hartley of the City of Dublin Gentleman may be permitted to enter into a Recognizance for Packington and Mary Edgworth, on account of their Appeal depending in this House; they being in Ireland:"
It is Ordered, That the said Thomas Hartley may enter into a Recognizance for the Appellants, as desired. Fraudulent Qualifications of Voters to prevent, Bill. The House (according to Order) was adjourned during Pleasure, and put into a Committee upon the Bill, intituled, "An Act for more effectually preventing fraudulent Qualifications of Persons to vote as Freeholders, in the Election of Members to serve in Parliament, for such Cities and Towns as are Counties of themselves, in that Part of Great Britain called England." 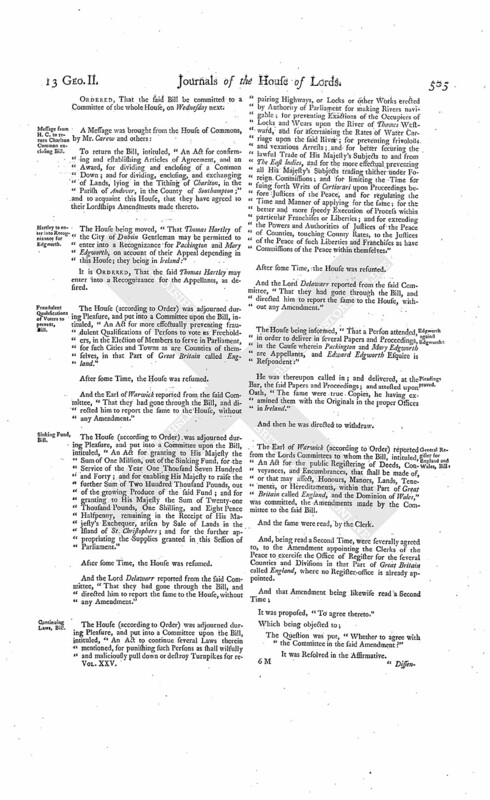 The House (according to Order) was adjourned during Pleasure, and put into a Committee upon the Bill, intituled, "An Act for granting to His Majesty the Sum of One Million, out of the Sinking Fund, for the Service of the Year One Thousand Seven Hundred and Forty; and for enabling His Majesty to raise the further Sum of Two Hundred Thousand Pounds, out of the growing Produce of the said Fund; and for granting to His Majesty the Sum of Twenty-one Thousand Pounds, One Shilling, and Eight Pence Halfpenny, remaining in the Receipt of His Majesty's Exchequer, arisen by Sale of Lands in the Island of St. Christophers; and for the further appropriating the Supplies granted in this Session of Parliament." And the Lord Delawarr reported from the said Committee, "That they had gone through the Bill, and directed him to report the same to the House, without any Amendment." The House (according to Order) was adjourned during Pleasure, and put into a Committee upon the Bill, intituled, "An Act to continue several Laws therein mentioned, for punishing such Persons as shall wilfully and maliciously pull down or destroy Turnpikes for repairing Highways, or Locks or other Works erected by Authority of Parliament for making Rivers navigable; for preventing Exactions of the Occupiers of Locks and Wears upon the River of Thames Westward, and for ascertaining the Rates of Water Carriage upon the said River; for preventing frivolous and vexatious Arrests; and for better securing the lawful Trade of His Majesty's Subjects to and from The East Indies, and for the more effectual preventing all His Majesty's Subjects trading thither under Foreign Commissions; and for limiting the Time for suing forth Writs of Certiorari upon Proceedings before Justices of the Peace, and for regulating the Time and Manner of applying for the same; for the better and more speedy Execution of Process within particular Franchises or Liberties; and for extending the Powers and Authorities of Justices of the Peace of Counties, touching County Rates, to the Justices of the Peace of such Liberties and Franchises as have Commissions of the Peace within themselves." The House being informed, "That a Person attended, in order to deliver in several Papers and Proceedings, in the Cause wherein Packington and Mary Edgworth are Appellants, and Edward Edgworth Esquire is Respondent:"
He was thereupon called in; and delivered, at the Bar, the said Papers and Proceedings; and attested upon Oath, "The same were true Copies, he having examined them with the Originals in the proper Offices in Ireland." The Earl of Warwick (according to Order) reported from the Lords Committees to whom the Bill, intituled, "An Act for the public Registering of Deeds, Conveyances, and Encumbrances, that shall be made of, or that may affect, Honours, Manors, Lands, Tenements, or Hereditaments, within that Part of Great Britain called England, and the Dominion of Wales," was committed, the Amendments made by the Committee to the said Bill. And the same were read, by the Clerk. And, being read a Second Time, were severally agreed to, to the Amendment appointing the Clerks of the Peace to exercise the Office of Register for the several Counties and Divisions in that Part of Great Britain called England, where no Register-office is already appointed. It was proposed, "To agree thereto." The Question was put, "Whether to agree with the Committee in the said Amendment?" Protest against an Amendment to it. Then the several subsequent Amendments, being also read a Second Time, were with some small Variations, agreed to by the House. It was proposed, "That the same be made Part of the Bill." The Question was put, "Whether the said Clause shall be made Part of the Bill?" Several Amendments, in Consequence of those already made, were proposed to be added to the said Bill. And the same were agreed to. Then, it being moved, "To order, That the said Bill be read the Third Time on the Second Thursday after the approaching Recess:"
The same was objected to. And it being likewise moved, "To order the Bill to be read the Third Time on Thursday next:"
The Question was put, upon the Motion last made. Ordered, That the said Bill be read the Third Time on Thursday next; and the Lords to be summoned. The House (according to Order) proceeded to take into Consideration the Report of the Conference had with the Commons, on Friday last, upon the Subjectmatter of the Amendments made by their Lordships to the Bill, intituled, "An Act for prohibiting Commerce with Spain." And the said Report was read, by the Clerk. Proposed, "To insist on the Second Amendment made by this House to the said Bill, to which the Commons disagreed." And the same was agreed to. The next Amendment disagreed to by the Commons being read; (videlicet,) "Before ["Port"], insert ["Foreign"];" it was agreed, not to insist. After which, it was agreed to insist on Clause (A), disagreed to by the Commons. Reasons to be drawn, for the Lords insisting on their Amendments to it. Ordered, That the Managers of the former Conference be appointed a Committee, to prepare Reasons, to be offered to the Commons, at another Conference, for the Lords insisting on the said Amendments. No more Appeals to be received this Session. Ordered, That this House will not, after Thursday next, receive any more Appeals during this Session of Parliament. 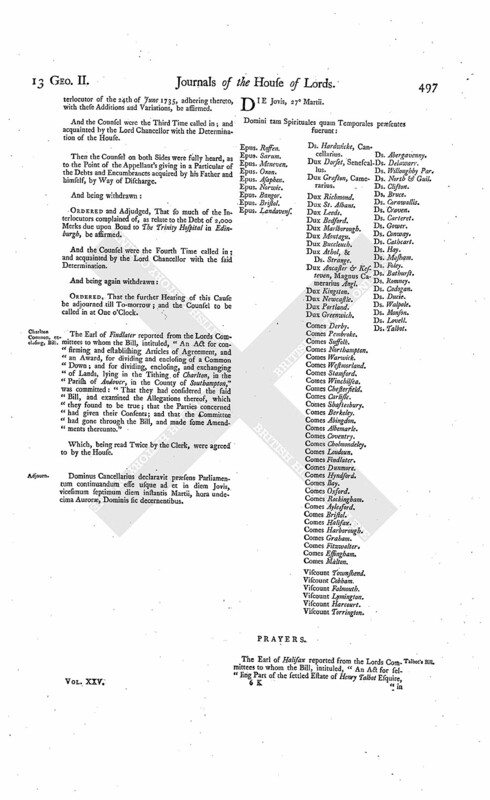 The Order of the Day being read, for the House to be in a Committee on the Bill, intituled, "An Act for exemplifying Wills and Deeds, and making the same Evidences." Ordered, That the House be put into a Committee thereupon, on this Day Month. Dominus Cancellarius declaravit præsens Parliamentum continuandum esse usque ad et in diem Martis, primum diem Aprilis jam prox. sequen. hora undecima Auroræ, Dominis sic decernentibus.